This is a great day to evening blouse, wear it to work and then happy hour. Sheer with an embellished collar. Long sleeve kimono with fringe bottom. 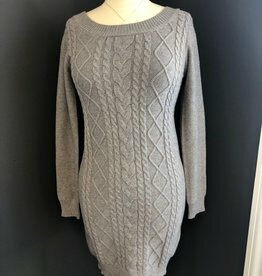 Wear it with a dress to dress it up or with jeans to dress it down. 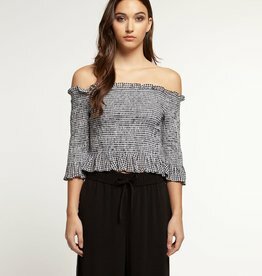 Off the shoulder top with slight ruffle at the hem. Adorable gingham print. Longsleeve v neck sweater with contrast stripe ribbing at neckline, bottom hem, and cuffs. This fitted long sleeve sweater is a great spring color. If you are between sizes we recommend going larger as the style is very fitted! 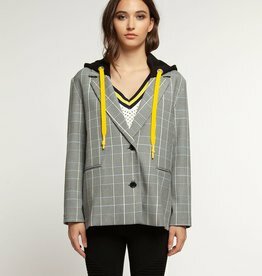 This hooded blazer with a solid black hood has a yellow draw string for a little pop of color. Style this top with jeans or sweats. 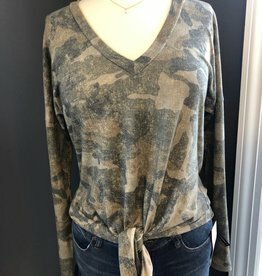 Subtle camo print, v neck. Mannequin is wearing a size Small. 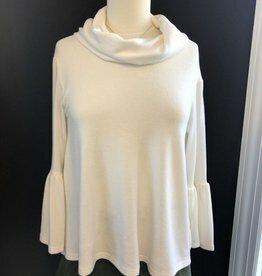 This top is buttery soft and with the cowl neck and bell sleeve you will feel cozy while looking super stylish. Mannequin is wearing a size small. Cute and cozy cable knit sweater with lace up back detail. Mannequin wearing a size Medium. Striped jacket with geometric buttons down the front. 3/4 split detail sleeves and stand up collar give this jacket a stylish edge. Pair it with jeans or dressy pants, either way you will look fabulous. Mannequin is wearing a 10. 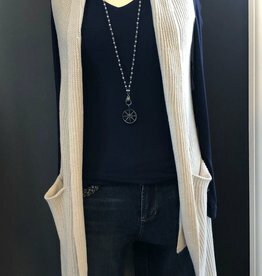 This long sweater vest is the perfect pairing to any outfit. Wear it with almost any color and dress it up or down. Mannequin is wearing a size Small. We offer a wide variety of styles and prices!